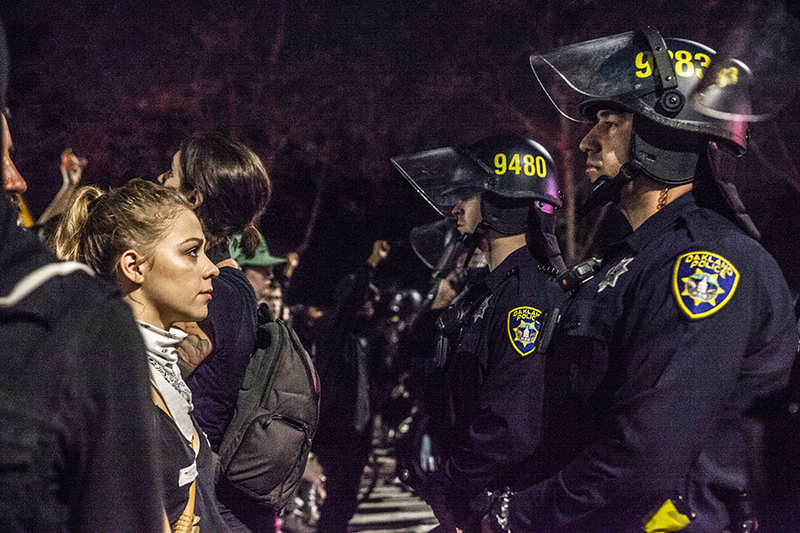 In Oakland thousands take to the helicopter lit streets each night since the election, protesting hate crimes and a police state. But the demonstrators are also at odds with each other. A pair of angry eyes behind a garbage container. Observation slits. Next to the young woman, who can barely look over the edge of the container, another mummed person appears, and yet another. “Leave us alone, we’ve been doing this for years,” she hisses at the other protesters, the container tipping. The crowd pushes back. From afar, seemingly bored, police officers are watching. It is just before midnight in Oakland. A thousand men and women had come to protest Trump, but for a moment they mainly protest each other. How far do they want to go to prevent a president Donald Trump? Putting something on fire? And if so, just the container or the car next to it as well, just as the night before, when two police cars and a Trump figure were burning here in Oakland? And do they want to prevent him at all or only show their non-adherence – online with the #NotMyPresident hashtag and offline with slogans in the streets? Should they plan to emigrate, proclaim California’s Independence (#CalExit) or simply hold out until the next election (#Election2020, #Michelle2020) or until a possible impeachment of Donald Trump? A thousand demonstrators, a thousand opinions. This time the moderate majority prevails. The container and the car stay safe and the crowd continues on its way, shouting “Peaceful protest”. Since Trump’s victory Tuesday night, thousands of people spontaneously take to the streets in protest – especially in California, where a majority of 62 percent expectedly voted for Hillary Clinton. Apart from largely peaceful protests in San Francisco, Berkeley and Los Angeles, Oakland lives up to its name as riot city. “Oakland is being Oakland”, as the Anonymous movement puts it on Twitter. The 15-year-old is just a normal student from Oakland, where just normal can also mean: She is queer, black, has many Muslim friends and grew up with godmothers who immigrated from Mexico and El Salvador. Bayleas talks fast, as if her energy and her ideas could prevent Trump from taking office. Or initiate an impeachment like “back then”, when Richard Nixon was removed from office due to the Watergate scandal – 26 years before her birth. Trump’s victory is particularly bitter for Bayleas, because she is not allowed to vote yet but will suffer from the consequences. Until Tuesday she dreamt of studying in Germany and becoming US ambassador in Berlin. Since Wednesday, all long-term planning seems absurd to her – this is how much she fears the day that Trump could implement his election program. Oakland is only one quarter white; African Americans and Latinos constitute the majority of the 400,000-inhabitant city. Most of the demonstrators are white however – many of them came to represent black and Hispanic friends who do not want to raise any attention since Tuesday. For different reasons. About eleven million people live and work in the US without proper papers; many have been contributing to the US economy for decades – in jobs that no one else wants. Up to now, so-called Sanctuary Cities such as Oakland and San Francisco have provided protection against deportations; in addition, Obama’s so-called DACA decree gave undocumented children and young people the right to study and stay in the US. Kelly-Hankins teaches many DACA kids. Their families were hoping that Hillary Clinton would reform the Immigration Law so that they could apply for a legal right of residence. Now many of those same families are planning to move heads over heal to a country they hardly know to prevent getting deported by the Trump administration. The demonstrators get a chance to start their non-American lifestyle immediately: they walk, jog, run as the police starts blocking the demonstration route after a few blocks. They stand in a long line, giants in black, shoulder to shoulder, with batons and pistols. A woman takes a gamble: She paces out the line of men, looking deeply into the eyes of each of them. “Would you also do this to your children?” Another woman lights sage, a man holds a flower out to the police men. The police officers shout a warning and start rushing the protesters into the opposite direction; their line moves fast, faster, a woman stumbles, she is rushed further. The cat-and-mouse game continues for miles and hours. The protesters want to reach the highway, the police want to prevent just that. According to a police report published the next day, the unannounced protest was declared illegal at 9pm. Nobody wants to have heard the announcement, the running and tripping continues. A helicopter with flood lights circles the protesters, their shadows rotate in all directions. At some point, they walk past a huge screen on a city building, where a giant Donald Trump makes a speech. They raise their fists. As the first stun grenade goes off, they recoil in panic. At the second flash and blast they aren’t frightened any more, just angry: “This is what a police state looks like!” Most of them have pulled scarfs over their noses – less to make themselves unrecognizable, but in anticipation of the tear gas, which soon nebulizes the view and creeps into a hundred noses. Just before midnight, the demonstrators come to a halt under a highway bridge – cops on both sides. “Whose streets? Our streets!” The slogans reverberate below the bridge. Two homeless people crawl out of their tents, where they watch protesters breaking through a grid and running up the embankment onto Highway 880. The sky above the bridge fills with blue light and police sirens. As the demonstrators return to the Plaza, residents have to wait in restaurants and cars alongside the road. But they don’t seem bothered, most wave and honk in solidarity. Only some look away in demonstrative disdain. A security officer in uniform films the march with her pink cell phone, smiling. The protesters have a lot of support in Oakland – despite the trail of graffiti and broken windows left behind by a few. Eleven people were arrested during the night, the police later reports.